Metalabs offers restoration, conservation + maintenance plans for metal art + architecture. Every work of art or architectural element in need of care undergoes a specific and science-based process to determine the least invasive solution based on unique circumstances. Backed by the metal expertise of A. Zahner Company, Metalabs is confident in treating and maintaining all types of metal, from aluminum to zinc (and everything in between). Work treated and maintained by Metalabs experts are guaranteed. We care deeply about the preservation of artwork for the enjoyment of current and future generations. Serving collectors worldwide, Metalabs offers a range of specialized treatment services tailored to fit each client's needs. Every work of art or architectural element in need of care undergoes a specific and science-based process to determine the least invasive solution depending on unique circumstances. Drawing upon decades of experience, each work Metalabs treatment is handled with the utmost care and concern for the artist or architect's original intention. Step one entails a comprehensive visual inspection of a work's current condition. 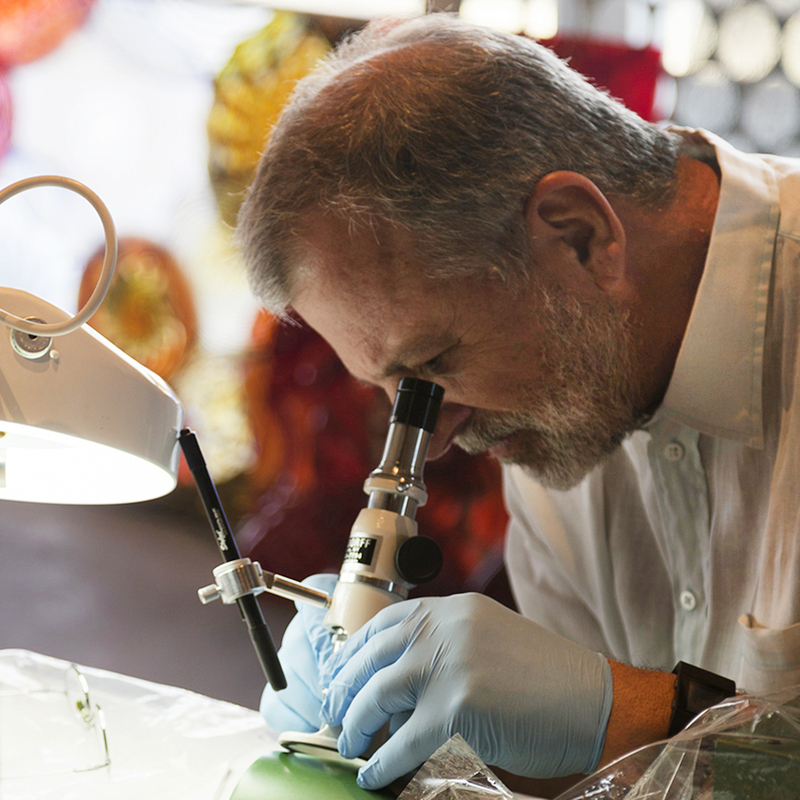 Our experts look for signs of deterioration or corrosion to protective patinas, seams and connectors. All areas of concern are digitally photographed along with a written evaluation. Following visual inspection and documentation, our team conducts extensive research and fact-based analysis to determine the best method for specialized treatment. Drawing from decades of experience, our science-based recommendations take into account materials, fabrication methods, site specific surroundings, and environmental factors. Solutions are provided on a per case basis. Treatment plans will vary according to material and unique conditions. Our goal is to provide minimally invasive solutions to clean and protect each work of art or architecture. Should restoration be required, we will consult directly with the artist, when possible, and proceed with scientifically-based process to ensure a protective yet reversible solution. Art and architectural objects treated and maintained by Metalabs experts are guaranteed. We care deeply about the preservation of artwork for the enjoyment of current and future generations. While under a Metalabs maintenance contract, artwork is warrantied against corrosion through attentive, preventive care. We measure our success by exceeding our customers' expectations. Metalabs offers solutions for the care of public art collections. From repair of a damaged fountain to annual maintenance for an entire outdoor sculpture collection, our expert staff works with city administrators, art commissioners, and other officials across the country. As long-time collectors of art, we understand the personal significance behind private art collections, and we promise to care for your collection as if it were our own. Metalabs offers personalized solutions for restoration and maintenance of interior and exterior sculptures in any location. Corporate collections often include sculptural art and architectural features in exterior and interior settings. Metalabs experts are skilled in troubleshooting corporate complexities; we offer specialized care to protect a company's investment in its collection. Architectural objects, both interior and exterior, are prone to the same set of potentially damaging elements as sculptural works of art. Metalabs draws on decades of expertise to repair and maintain architectural elements of any scale. As an affiliate of metal engineering and fabrication company, A. Zahner, Metalabs offers a wealth of resources for artists to understand how to maintain their work from concept to installation and beyond, ensuring each unique vision remains cared for in years to come. For additional information on how artists can benefit from working directly with Metalabs and Zahner, please contact us.